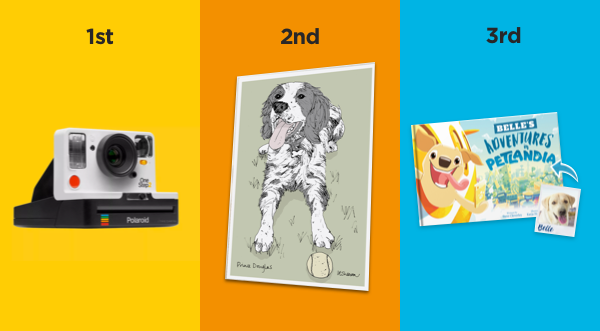 Explore the lives of Tinseltown’s dog actors and win Polaroid OneStep2 Camera worth £120! As the centre of the movie world, Hollywood is known for its riches. Countless celebrities have struck gold there, going from struggling actors to global megastars in the space of a single Blockbuster. But did you know that many dogs have also made fortunes in Hollywood? Canine co-stars have played major parts in more movies than you can shake a stick at - including Turner and Hooch, K-9 and Marley & Me. What’s more, dogs have even taken the lead role in feature films like Beethoven and Scooby-Doo (even though we know Scooby was CGI). So it’s clear that dogs are important to the movie industry – but how much money do they make? Are dog movie stars really rolling in cash? Take part in the Hollywoof challenge! To explore the fascinating world of movie dogs, we’re inviting you to enter our #Hollywoof competition for the chance to win one of three fur-related prizes! Make sure you’re following Everypaw on social media, as we’re going to share updates about the competition regularly. To enter, take a photo of you and your pet recreating a scene from a famous movie. Then share it on social media, tagging Everypaw or using the hashtag #Hollywoof. You can recreate any scene you like, using any animal you want, as long as it’s your pet! The competition runs from the 7th of December 2018 - 6th of January 2019. Follow Everypaw on Facebook, Twitter, or Instagram to see updates and check out what other entrants are doing. Have fun! The competition is open to all UK residents aged 18 years or over, except employees of the Promoter, their families, agents or any third party directly associated with administration of the competition. All entries must be submitted via Facebook, Twitter or Instagram using the hashtag #Hollywoof OR tagging @everypawUK (Twitter), @everypawuk (Facebook) or @everypawuk (Instagram) OR replying to competition posted on our social channels mentioned above and only one entry per person is permitted. There will be three (3) individual winners. The opening date for entries is 09:00 on 7th of December 2018. The closing date of the competition is 23:59 on 6th of January 2019. Entries received after this time will not be counted. By entering the competition the winner agrees to allow their name, pet’s name and location to be used on the Everypaw website indefinitely, in any media outreach in relation to the campaign (for up to one year). Three (3) best photographs will be picked by an independent judge by 11th January 2019. 1st Prize: Polaroid OneStep2 camera. 3rd Prize: Personalised Petlandia book. The winners may be required to participate in publicity related to the competition, which may include the publication of their names and photographs on Everypaw’s social media accounts (for up to a year), any media outreach (for up to a year) and inclusion on the Everypaw website indefinitely . The Promoter reserves the right to use any entry collateral in further marketing activity explicitly relating to the competition for the duration of the campaign. The winners will be notified on the appropriate social media platform using details provided at entry before 14th January 2019, and must provide a postal address to claim their prizes. If a winner does not respond to the Promoter within 76 hours of being notified by the Promoter, then the winner's prize will be forfeited and the Promoter will be entitled to select another winner in accordance with the process described above. The prize will be sent to the winners by post and/or arranged with the winners within five days of being notified of their win. The prizes for the winners are non-exchangeable, non-transferable and no cash alternative is offered. The prizes are supplied by Everypaw, Pinnacle House, A1 Barnet Way, Borehamwood WD6 2XX (the "Supplier"). The Promoter reserves the right to replace any prize with an alternative prize of equal or higher value if circumstances beyond the Promoter's control makes it necessary to do so. A winner's name and county can be obtained by sending an email to marketingteam@cardifpinnacle.com within three days after the date of the closing date of thecompetition . Insofar as is permitted by law, the Promoter, its agents or distributors will not in any circumstances be responsible or liable to compensate a winner or accept any liability for any loss, damage, personal injury or death occurring as a result of taking up a prize except where it is caused by the negligence of the Promoter, its agents or distributors or that of their employees. Your statutory rights are not affected. The Promoter of this competition is Everypaw (Pinnacle Insurance plc) Pinnacle House, A1 Barnet Way, Borehamwood, WD6 2XX.